Today Paper Makeup Stamps is sponsoring not 1, but 2 challenges!!! And in case you missed our post yesterday, PMS is having a design team call! We have lots to share with you today, so you may want to grab a cup of joe for this one! Of course this challenge is near and dear to my heart, as I am also on the challenge design team. I love those girls and they have wowed me yet again with their amazing creations! You may remember last time we sponsored with a monochromatic challenge! This time we are swtiching gears a little bit and asking you to use YELLOWS. Go over to the Copic Creations Blog to check out what the team has done and see what you need to do to get yourself entered to win! PMS is also sponsoring Thru the Craftroom Door this week! Our challenge over there is to use Any Winged Thing! Um, thats not a hard task with PMS, right?! We have plenty of winged things from fairies to butterflies! Thru the Craftroom Door is an online magazine run by 2 of my online buddies, Suzanne Dean (also a fellow Copic Creations team member, i heart her!) and Marti Wills. You really should check out their magazine for some amazing inspiration! But you don't have to be a subscriber to play along! Check out their challenges HERE. 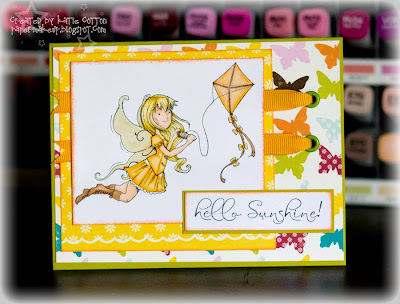 Here is my card using the new Lea stamp and previously released simple sentiment, Hello Sunshine. Check out all the new releases HERE. You can see that I colored my card in all yellows plus used a fairy for my winged thing. Check out what some of the other Paper Makeup Artists made to share using winged things! And wait... there is 1 more special announcement you may have missed yesterday! 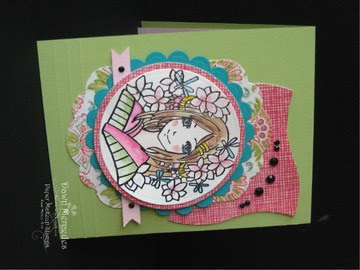 Paper Makeup Stamps is having a design team call!!! That's right! Check out THIS POST to read all about it and submit your designs! Have a most wonderful day everyone!!! !